The name Chrisma is the contraction from their first names. 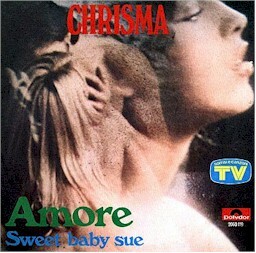 In 1976 Chrisma recorded in the studio of Vangelis in London the single "U" and "Amore" with the producer Nico Papathanassiou and his brother Vangelis. Their collaboration with Papathanassiou and Vangelis continued in 1977 when they recorded the album ""Chinese Restaurant" and in 1979 the album "Hibernation"
The first single: "Amore" / "Sweet Baby Sue" was released in 1976. In 1980 the name Chrisma was changed into Krisma. * Only these lyrics contain music of Vangelis. 'Amore' Composed by Vangelis and Christina Moser (Vangelis is credited as 'Richard Broadbaker'). Lyrics transcribed by Marcello Pibia.